Poster of Declaration Signers Painting 22" x 26"
Our Products >> Poster of Declaration Signers Painting 36" x 24""
This large beautiful poster brings meaning and identification to the Declaration signers at your event. It is a economical copy of the famous painting called "The Declaration Signers" by famous artist John Trumbull. 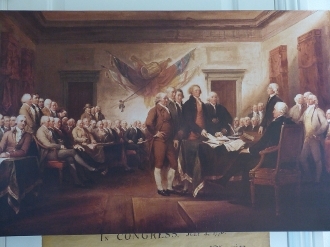 Poster of Declaration Signers Painting 36" x 24""